Recent 3DS title Mario & Luigi: Bowser's Inside Story + Bowser Jr.'s Journey has had a pretty rough launch period, with early sales showing that it is currently sitting amongst the worst-selling Mario titles ever released. In its home region of Japan, Mario & Luigi: BIS + BJJ (how do you shorten the name of this thing?!) has been struggling to break the top 50 chart positions in recent weeks despite only launching at the very end of December. You probably don't need us to tell you that Mario games usually perform incredibly strongly in the Japanese charts, but a life-to-date sales estimate of just over 20,000 units is worryingly low for our favourite plumber. To put this into perspective, other recent release New Super Mario Bros. U Deluxe has already shifted an estimated 381,469 units with less time on sale. Of course, the game is part of a different series and perhaps appeals to a slightly different audience, but both games are essentially ports of older titles with the main difference being the system of choice - 3DS for Mario & Luigi, and Switch for Mario Bros. U Deluxe. The estimated figures come from GameDataLibrary, which has tracked Japanese sales for all games up to 3rd February at the time of writing. The screenshot captured below shows the worst-selling, Nintendo-published Mario games to date in Japan and, as you can see, Mario & Luigi: BIS + BJJ is currently sitting amongst download-only titles and even a Virtual Boy game. Sales will undoubtedly rise from this number a little over the coming weeks, but considering it has already dropped out of the top 50 bestsellers by a considerable margin, it won't be rising as much as fans of the series might hope. Whether or not this might impact the future of the Mario & Luigi series is unclear, but it looks pretty safe to say that releasing the game as a 3DS exclusive didn't help this one's chances. 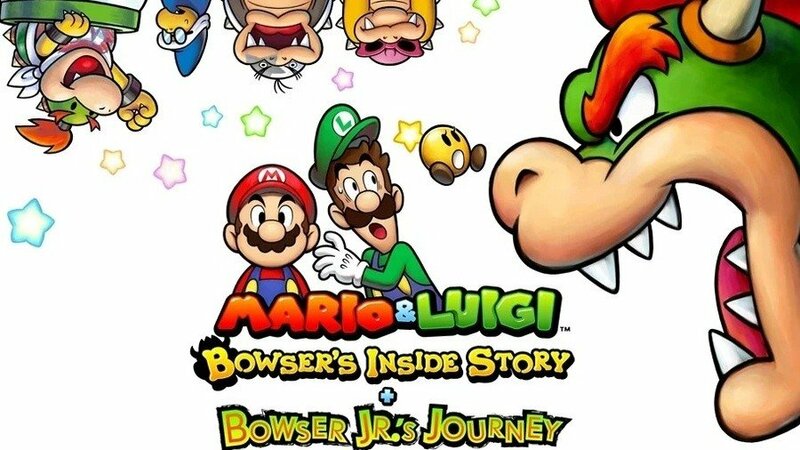 Did you pick up a copy of Mario & Luigi: Bowser's Inside Story + Bowser Jr.'s Journey? Do you wish it had launched on the Switch instead? Let us know your thoughts on this in the comments below. I don't think many people can justify the price, on a seven year old console for what is a remake. A great game, but many people see the 3ds as already dead I think. I suppose that is what happens when you release a remake of a game you can play on 3DS anyway at the tail end of the system's life. Safe to say Kirby will be their last game for it? 1. the game is already available on 3DS as a DS game for 1/4 of the price. I'm surprised to see a Virtual Boy game charting at all, and it apparently sold more than some 3DS games. Wow. In regards to the game in question, this is the drawback of backwards compatibility. The original game is playable on the same system and whatever was added didn't justify the increased cost in the eyes of gamers, clearly. The problem is that you can already play BIS on the 3DS. Mario and Luigi is one of my favourite RPG series, and I didn't even buy this game, not cause I don't want it, but because I already have pretty much exactly the same game already. I just hope that they take this as "we need to make a new M and L on switch" and not "no-one wants to play M and L"
Released during the system's dying days. Remake of a game that you can already play on the system. All in all, not a huge recipe for success. "2. No one wanted to buy new 3DS games"
But i still want 3DS games. I still buy some new 3DS games or Older 3DS games that i have never played before. Yesterday i preordered Yokai Watch 3 & Blaster White Dog Squad on my game shop. The owner will try to get those games on 1 week so i can pick them up on the next Sunday. That's surprising to say the least. Though on hindsight I guess if you aren't interested in the Minion Quest part of the game you're better off just sticking with the original DS game. As much as I'm not a fan of Partners in Time, they should've remade that game instead. Shame, because it looks cool. I really hope this doesn't affect the chances of Mario and Luigi Partners in Time from being remade on the Switch, nor a new entry in the M&L series all together being made. I suppose since the Paper Mario series wasn't killed off by Sticker Star, I hope this doesn't affect the M&L games negatively. 1. I have a gaming backlog of almost 15 games I need to finish. The Switch should be their main focus at this point. Nintendo making games for the 3DS is the equivalent of someone purchasing Jordans for someone dying of cancer in a hospital bed. This should have been on the Switch. As others have said above, you can already play the original on your 3DS and the system is on its very last leg. Shame, because I'd probably have bought a Switch remake. It’s the port that no-one asked for. These titles are quite linear within their genre; once you’ve exhausted it there is barely nothing post-game, unlike other games JRPGs re-released from the DS day’s. There's probably two reasons this game happened. First was to keep AlphaDream employed, a second party developer known for developing 2D RPGs exclusively for handhelds. Second was to keep the 3DS going a little longer, as part of their evergreen strategy and a cheap option for a younger market. But it seems as though even the latter won't last now, I have doubts about Kirby's Extra Epic Yarn selling too. AlphaDream will need to adapt to the Nintendo Switch or they might be finished as a developer. They might not be able to get away with low-resolution high detail sprite work any longer. "the main difference being the system of choice"
I disagree. The main difference is the style of game, one's an RPG and one's a platformer. Yes, they're on different platforms, but that's not the main difference IMO. Because Nintendo still wont and never will learn that their pricing structure is out of date and makes no sense. Every time they re-release a game they think its ok to jack the price up. Remakes should never ever be full price unless they have a load of new content added. Take Crash Bandicoot for example, 3 games fully remade from the ground up for $40-$50cdn same with Spryo. Then look at this one and Super Luigi they are full price games that released years ago. That's not how the industry works. they are just lucky that Super Luigi sold well. You can run a business expecting people to pay full price for a 5+ year old game. Not when the PS4 and the Xbox one has AAA titles for much less. Hey do you want a 7 year old re-release for full price? Or would you rather get pay Red Dead 2 on sale for much less. I mean hell look at Shadow of the Colossus. That was a complete overhaul, new graphics engine, recorded music everything. They built it pretty much from the ground up and charged half price for it. It’s a 2019 3DS game that’s a remake of an old DS game that’s already playable on 3DS. There’s literally no point in buying this whatsoever. I still have the DS version, so no thanks! But my brother bought it! He’s a Mario & Luigi fanatic, so even though he has an OG copy as well, he got it anyways. Normally I would've picked up a new Mario&Luigi game day 1 but this is the second remake in a row which tells me they don't know what to do with the series anymore, especially after the horror story that was Paper Jam aka Babysit Paper Toads. The series has lost its magic for me unfortunately. I'll still pick it up eventually but not after a good price drop. I still have the original anyway so if I really crave some BiS I'll just boot that one up. @SuperCharlie78 I don't think Paper Jam did well either. I think this series is finished. Maybe Paper Mario can get back to it's RPG roots now. While the year-gap is there, the console gap is not. Had this game come out on Switch, or had the remake been one of the much-more-in-need-of-improvement Partners In Time, we'd be singing a much different tune. It hasn't been the case and it shows. Definitely going to buy this one for my girlfriend when she finishes Dream Team, Paper Jam and Superstar Saga; as for me, my DS game card will suffice. Seriously, the 3DS' backwards compatibility is there for a reason, what were they thinking? Port it to Switch and it will be a 2 million plus seller. Come on Nintendo it would be dumb not to. Was planning on buying this, but you can't play it in 3D. No thanks. I'll buy it at $20. I'm going to go out on a limb and say no 3DS game is going to sell particularly well. Maybe if they had been released on Switch or at least when the 3DS was still alive. I saw no need to buy the game again as I still have the DS version. Competing against another Mario game on the same day couldn't have been good for its sales either. Similar to Minecraft and other recent games. Exactly what other people have said. If the game have released in the Switch instead of the 3DS/2DS family consoles, it would have had decent sales. Not to mention that they should have remade Partners In Time first because that game is the sequel of Superstar Saga. Also I find it difficult to use four buttons to use many special attacks between Mario, Baby Mario, Luigi and Baby Luigi. They need to fix that if they made a remake (hopefully) in the Switch. It's a full-price port to a console that can already play the original, and the new one isn't even in 3D? Why would anyone buy it? Drastically reduce the price, and then I'd consider it. I put 10ish hours into the Superstar Saga remake and it just didn't click for me. I'm still up for buying more 3DS games (and will definitely get both of Atlus's 2019 releases this year), but the ports Nintendo is choosing to release don't appeal. The New 3DS was such a wasted opportunity. So many SNES VC games and ports left on the table. Xenoblade was such a great tease of what the upgrade could bring, then they never took advantage of its upgraded power again. The only interest I had in this game was for the Mario series Bowser Jr. amiibo I am utterly convinced is the entire reason this game exists. If they hadn't cancelled the amiibo I would have bought both the game and the figure. As it stands, I'll stick to the DS version that still works just fine on my 3DS thanks. @Mando44646 The last 3DS game I bought was Kirby Battle Royale about a couple of years ago. I just don't see why this game exists. I played it on DS, I had no desire to play it again on 3DS, especially when there is no 3D? Pretty much done with 3DS tbh, might play it from time to time and will probably pick up Detective Pikachu closer to when the movie comes out. 3DS's sunset. In interviews they say they didn't expect it to be so quick, they didn't know so many people would adopt the Switch so early, but I can understand why people would prefer to save the money for a future just twice the price console and then saving the money quicker than expected. I also can see why people wouldn't be interested in a game available in DS and with almost no changes in 3DS. Stereoscopic 3D would have boosted sales in this case, if you ask me. I have a feeling physical copies (especially sealed) might be pretty valuable in 5-10 years. The original is still great, and this one doesn't even have stereoscopic 3D. Maybe people are boycotting Nintendo for skipping over Partners in Time remake? Like a lot of people on here have stated they still have their DS copy I think it don't make since why Nintendo would release this it is basically the same game and the copy they have can be played on the 3DS. I agree with the many that have stated that the same game can already be played on the 3DS using the DS version and a good many people still have that copy from the past. Nintendo seems to be under the impression that they can keep rehashing these games, making them available on their current system and people are going to buy them. I don't know about you guys but I hate buying the same game over and over and I'm not going to re-buy something unless there is a considerable advantage to doing so. Take Metroid Prime Trilogy for example. If the rumors are true and they do end up porting it to Switch, then yes, I will buy it again because it will be the only version that allows me to take it with me where ever I go. That is a huge advantage for me despite the fact that I own the original Wii steelbook version. Re-releasing a game like BIS has no advantage from what I can see if you own the original. Seems like Nintendo is just trying to get some releases out in an attempt to keep the 3DS alive. I love my 3DS but it's time to put it out to pasture as the Switch has been satisfying our home console/portable needs. If their intent was to keep the 3DS alive a bit longer then they kind of shot themselves in the foot by releasing a hybrid console. I'll just stick with the DS version. Considering the 3DS is backwards compatible with DS games and it came out very late in its lifespan, not to mention it costs full price, there's no need to get the 3DS version. At least with Superstar Saga, it makes sense because there was no way to play GBA games on the 3DS (the ambassador program, sure, but Superstar Saga wasn't part of it). This was such a weird choice to milk as a remaster, I have no idea why they did it. I didn't have a DS, so I missed Bowser's Inside Story, until I bought a launch 3DS. There wen't many games on 3DS at the time, so Bowser's Inside Story was one of the very first games I played on 3DS......near launch....almost 7 years ago. Why are they releasing the "remaster" of a game that was still big when the console came out on the same console? I mean what, are we going to get Breath of the Wild Remastered in the last year of the Switch? No surprise here. While some people do still buy 3ds games I'm sure very few are eagerly awaiting the chance to pay full price for one. Seeing as the ten year old game it was remade from is already playable on all current gen 3DS consoles, many people skipped it. That and the fact that 3DS has fallen massively out of favor. I don’t expect much in the way of first-party support from Nintendo on 3DS after Extra Epic Yarn. The fact that a Mario title is selling such awful numbers is a definite case of handwriting on the wall for 3DS. I never was too big on the M&L series in general but this is the point in the series where they started going really bonkers with all the special moves taking forever due to the obnoxious inputs (especially the ones that force you to use the touch screen), not a fan in the slightest. For that reason I think that it really is just a bad game, plain and simple, the funny dialogue and good soundtrack can only take you so far. @Anti-Matter Buying existing 3DS games is one thing - and Level-5 just takes f'ing forever to localize the Yokai games (same for Atlus and Persona). Wouldn’t be surprised if this turns out to be developed by Alphadream’s B team and the A team is developing the true next installment for the Switch. @Yosher As far as i know, Paper Jam isn't that good of a game because the original plot it was going to have turned out to be too much of a mess, so they had to heavily simplify it. And honestly, it's the only bad M&L game they've made IMO. As for the remakes, i'm pretty sure they were just trying to get more games to extend the 3DS's life span, doesn't mean they ran out of ideas, they just didn't want to spend too many resources on, what many people say is, a dying console. It was reported a few months ago that Alphadream is making a game for the Switch, it might not be M&L, but this gives me hope we'll get a new one for the Switch. wonder why its not selling. I’ve never been tempted to play any of those games honestly. It isn't the 3DS, it's the price and the fact that M&L games just don't seem too popular. Does this version support steroscopic 3D? If so, I'll probably pick it up. If not, I already have the original DS cartridge. As a huge fan of steroscopic 3D, besides a few exceptions, I won't buy 3DS games that are 2D only. @Crono1973 Oh come on, I love M&L, but I'm not buying a 3DS remake of a DS game. I can literally just slot in my DS cartridge on the 3DS if I want to play it. I'd have bought it day 1 on the Switch if it was updated to nice 2D HD graphics. You don't think that has anything to do with it? Just want to chime in that I love the Mario & Luigi series and would snap up a Switch version. I just think it's the situation this game found itself in, is all. @MimoDX2 I hope you're right. Paper Jam was indeed the only bad entry in the series, but to me, Dream Team was where the series started to show an increasing lack of magic that the series has shown before this game. It was still an enjoyable game, definitely much moreso than Paper Jam, but I still didn't enjoy it nearly as much as any of the three games that came before it. It felt avarage, if anything. Bowser's Inside Story 3D hasn't even surpassed half of the lowest previous Japanese launch for the series with it currently at 20,600 copies sold. @Dualmask Mario Tennis on VB was my favorite game I had of the 5 I had for VB which was like 1/4 of the games for that system lol. A future rare game that retro collectors will pay big money for? It's an old game. Peeps want new games. I bought it, but even as someone who’s pretty obsessed with the Mario & Luigi series and has 100%ed all of them (including the extra challenges that started in Dream Team), I could not get into this remake. The series is getting stale. I regret buying it, and not just because I played it on DS several years ago. It’s just not a very good remake; it feels sanitized and the lack of 3D has zero justification—it doesn’t even have the 60fps that Superstar Saga got in 2017. Just kind of a baffling release. Though it’s worth noting that low stock might be part of the reason for low sales: my local GameStop and Walmart both only got two copies in, and I had to go to multiple places to find mine. Unlike some of the people on here, I don't own the ds version and I'm still working in the last remaster title in this series. To add insult to injury I'm not buying a whole lot of 3ds games these days cause I expect much of what is out there to see a switch port. Why buy a 3ds version when I could get one on my tv with switch. In addition to that I might as well wait till it is half off to buy it since the sales of this title will likely convince Nintendo not to port it and I'm not going to pay full price for a sequel to a game I haven't finished on my 3ds lol. It's a shame but I think the target audience was me, I think those like me don't have reason enough to grab this game. Nintendo geeks clearly aren't picking up the slack for people like me. I do not think backward compatibility is the issue given how many are willing to buy the ezio collection on xbox one even though bc for those titles had been added. I will agree that a lack of 3d and other new features probably hurt it. Maybe Bowser Jr just isn't as marketable is Nintendo thought. @link3710 The graphics are updated on the 3DS version I'm sure. For you I guess it's all about the system. @Mrtoad It needs a price cut. You mean an uglier remake of a game already playable on the same console doesn't have mass market appeal? Granted personally even if it did have some reason to buy I wouldn't have bought it because... Yeah, I'm not at all a fan of the original. @Crono1973 I mean, they're updated, but not significantly IMO. In fact, I think the update looks worse than the original. I was talking about like, something with illustrated sprites rather than pixel based ones. I bought it even though I could have easily bought the DS version, just because I was happy to buy something for the 3DS in 2019, but I have to admit that a remake isn't that appealing, and that apart from what I've said some posts above about people buying the Switch sooner than expected -thus abandoning the 3DS- and not enough people buying the 3DS now as a new console, it's true that there already are dozens of milions of units out there, but old 3DS owners already have the Switch, isn't it true? We moved on. We would like to see a really appealing new release for the 3DS, but now it's all remakes and ports, mostly without the main selling point of the system, which is the stereoscopic 3D feature. Jeez, a lot of doom and gloom here. Most of the good talking points have been covered already, but as a 3DS title competing with THREE other Mario & Luigi games already (one of which is a Select), this game was always going to be dead on arrival. Unlike a lot of people, I don't really want to see the 3DS die a swift death, but if they're being honest about its future and not just delivering PR to get people to buy up remaining units, any future titles for this system have to be more sensible. Captain Toad had the right idea: Dual release, HD on Switch and 3D on 3DS. People that claiming that the 3DS is dying or already dead, that's only because YOU have determined it to be so. There is technically NOTHING WRONG with the New 3DS XL out right now. It's literally one of the best portable game machines for sale today. The Switch is more powerful than the New 3DS XL, but the New 3DS XL fits in your pocket MUCH EASIER, has a protective clam shell built in, and has a MASSIVE games library available. The New 3DS XL graphically delivers exactly what a portable game console should. Nobody should expect a portable game console small enough to fit easily in your pocket to deliver current gen graphics performance. Seriously, it's annoying that everybody is writing off the New 3DS XL just because the Nintendo Switch available and a good system. I own both the New 3DS XL and Nintendo Switch, and I see them both as being great at what they were designed to do. I would continue buying new 3DS games (physical cartridge. not download) for many, many more years if they keep making new ones. The original Bowser's Inside Story sold like 4+ million copies on the DS. Mario & Luigi is no Mario Kart, but those numbers are far from tiny. BIS bombed on the 3DS because the 3DS is dying. In Japan, the 3DS is already dead. I'm assuming this doesn't count digital sales. But really, I feel like Nintendo does this to themselves. At least where I live, Nintendo never refreshes 3DS stock. My eb games and best buy have all told me Nintendo rarely sends stock of 3DS hardware and games. When it's a new release, they only send enough for pre orders. The 3DS shelves are always bare and it doesn't seem like Nintendo is taking the thing seriously then acts shocked about sales results like these. It's kind of the least desirable thing they could have done. You can Play the DS BiS on 3DS already, it's the 4th Mario & Luigi game with the Dream Team art style on the 3DS and released so late in the systems lifespan. They've saturated the 3DS with M&L that a Tomato Adventure remake/remaster/localisation might have done better. I wonder if perhaps they should make a brand new Mario RPG series for Switch rather than Mario & Luigi. @westman98 Yet, Paper Jam sold only 49,000. Why didn't it sell well? I think this franchise is done no matter which system you put it on. I guess we'll have to see what happens with the next entry, if there is one. I feel like it was barely marketed. Didn’t realise it came out until like a week later. Plus, let's be honest here, the 3DS is on its way out. I actually just finished this game over the summer, so I’m not looking to play it again anytime soon. The new content looks interesting but I’m not sure it justifies the price. Paper Jam sold 49,000 copies in its launch week in Japan alone. It's global LTD sales are around 1 million, which isn't nearly as high as that of the original Bowser's Inside Story, but like 10× bigger than what the Bowser's Inside Story remake will end up selling. A brand new quality Mario + Luigi game on the Switch can easily replicated the success of the original Bowser's Inside Story. No 3D no buy. I got Warioware Gold but they dropped the ball with no 3D in that game too. "Oh I gUeSs YoU dOn'T lIkE bOwSeR jR. sO wE'lL jUsT sToP mAkiNg MaInLiNe RoLeS sTaRrInG hIm"
It also released during the time of Smash and Switch sold a ton of units. See? EVERY SINGLE 3DS release after Ultra Sun/Moon is a commercial failure. Nintendo is killing themselves releasing games on 3DS now. I bought it (mainly for the Minions segment, plus I'm a bit of a collector ), but I also have the original DS version and actually played through that only a couple of years ago...on the very same New 3DS I still play on. It's bonkers to release a remake of a game on a console that's backward compatible with the existing old version, unless substantial additions and improvements are made to it, and as far as I can tell the main game's identical asides from a different (arguably worse) visual style and a couple of slightly tweaked bits of music here and there. Also, the 3DS is pretty much a dead console now on this side of the globe. Yeah, long time fans like me will still support it but it's had no exciting 'big' releases over the last year that aren't just ports or updates of older games and it's well known even to casuals that the next main Pokemon game will be on Switch. There's not many reasons for the masses to carry on playing on 3DSes in 2019. It's sad that Yokai Watch hasn't managed to catch on in the West as much as it needed to, to help keep the 3DS alive but maybe even that'll find more of an audience if Yokai Watch 4 for Switch gets localised. Still play Monster Hunter 3, 4 and Generations on 3ds a lot. I play more 3ds than switch tbh. So i crave for new titles om 3ds. A port of Super Mario 3d World would be supernice. But BIS is a stupidly lazy port. @Kriven You're confused why the remake for a dual screen game was made on a system with dual screens? I was optimistic for the 3DS to have one last decent year in 2019, but it seems that the party is pretty much over. Luigi's mansion underperformed and now Bowser's Inside Story has flopped. I am not sure how much of this has to do with people not being interested in 3DS and how much has to do with people not being interested in remakes of games that they have already played. I still have 2-3 games that I need to pick up for 3DS. I should probably swing by EB Games and get Etrian Odyssey Nexus on the way home. However, if there are no new releases from Nintendo after Kirby's Epic Yarn that is OK with me. 3DS has had a great life. I cannot complain about the size of the library that I have for it! Exactly. Alpha Dream stated in an interview that they remade the game on 3DS because they wanted to retain the dual screen design of the game. I am sure there will be another M&L game and it will be on Switch. @RatKing64 Switch port beggars need to go play their Switch instead of port whining. You want to tell me that Switch boxing sold more than this game in Japan? That Kirby Epic Yarn demo is also a let down. It is not in 3D. Not buying. Bowser's Inside Story is my favourite Mario & Luigi game by a fairly wide margin, but I haven't picked it up for a couple reasons. 1) I've mostly moved on from the 3DS, as I'm sure is the case with many others, and 2) there's so much out on Switch that I literally don't have the money to buy it. My wallet has been destroyed from November onwards and I don't make very much money to begin with. And the releases don't look like they'll be slowing down anytime soon! I did not buy this but would have bought it in a heartbeat on Switch. In fact, the same applies to Luigi’s mansion and Kirby’s Epic Yarn. This release was NEVER about the sales. Remakes like this are great for whipping freshly formed teams, fledgeling leaders, and new artists and programmers into shape. They get to rebuild an entire game from the blueprints, and add that little bit to make it their own. They work on well known hardware, with a thoroughly field-tested pipeline, and highly refined tools. If they do it on time on on point, they get to make cooler stuff in the future. This game and the previous remake are hitting the younger 3DS owners at a time where they might consider letting go of Nintendo entirely. If they play something like Bowser's Inside Story as their first Mario based RPG, and possibly as their swansong title for the 3DS, they won't be in doubt that future systems will host deep, meaningful, and also hilarious games for all ages. Nintendo's been in it for the long run since forever, and this release strikes me as a strategy piece moreso than anything else. They makes games, and if they want to make a long-term business out of it, they also gotta make some games that aren't expected to sell gangbusters. Can't all be a gamble. Can't live in a card house. The only issue I had with DS Bowser's Inside Story was that some fights playing (Spoiler for those that haven't played the original) as Giant Bowser were kind of difficult. I may buy this remake, if those fights have reduced difficulty. The chances are that if you own a 3DS, you owned a DS and already have these games on the DS. If I can still play my game on the DS, why bother getting on the 3DS? @Kainbrightside Not to mention the original DS cart can be played on a 3DS. Nintendo thought people were still into the 3DS, gamers disagreed and voted with their wallets. Maybe now Nintendo, you can perhaps call it a day with the 3DS and go full on Switch support (And mobile)? The biggest issue for me is the lack of creativity. Nintendo decided about 2 years ago they wouldn't create new games for the 3DS, they would just port everything over. Samus Returns is awesome but a remake. The M an L games, the "new" Kirby game, and even Ultra Sun and Ultra Moon are all remakes in some way (not fresh ideas). There was a run of about 4 years where the 3DS was getting amazing games but even a series like Fire Emblem eventually did the remake thing with Echoes. It's a strategy that fans aren't connecting with and software sales are plummeting. Nintendo needs to realize that 2019 is the last year for the 3DS. I hope they shut down production of the system after one final holiday season. I always had an issue when people compare any game that bears the "Mario" game on it with another one. Even when it doesn't make sense. For mainstream audiences, a MARIO game is a platformer one. Why comparing this RPG (which is a somewhat niche genre) to the most accepted and recognized platform games? RPGs sell more than before but they are still far from being 100% mainstream. Of course NSBMU will sell more than M+L remake. That's a dumb comparison. Back to M+L sales. Did people actually expected this game to sell a lot? 3DS consoles are slowing most of the fanbase already moved to the Switch. Besides nobody from that group wanted or asked for this game.Yes, it sold a lot on DS but many people that has it can already play with their old cart instead of spending another 40 bucks for the same game without any substantial changes (and it seems that the Bowser Jr story wasn't well received). I doubt Nintendo will worry that much. This was a B maybe C game just to fill the catalog of a console that is on its way out. Maybe it suffered from poor marketing? I just realized this was a thing yesterday because I saw it at Target. ...And apparently Nintendo is going to keep supporting the system. @ClassSonicSatAm Mario's Tennis was not bundled with the VB in Japan I think. However, I think of the two regions the VB was released in, I think it actually sold better in America. Wow. This hurts. Inside story was a great game. This is a DS remake, so it's likely that many people already own the game and have little interest in upgrading to another 2D version of it when they can simply insert the DS card in the 3DS and replay the game for free. I did the review and absolutely loved it, but I probably wouldn't have bought it otherwise. I love my 3DS, but I have enough new games for new consoles on my wishlist, and I feel this sentiment is felt by most of the 3DS install base now. The 3DS had its moment, but now we want to spend our money on Switch games, not 3DS ones. The 3DS is the ONLY system in the games market capable of effortless stereoscopic 3D gaming. Imagine the SEGA Classics or Excite Bike etc without it. Would that many people bother getting them on 3DS? Why on earth didn’t they release this on the Switch instead it would have sold very well but not on a dying system that no one bothers with. Not to mention it’s at full price but of course Nintendo would have gotten away with it on the Switch and people would have lapped it up. You only have to look at the re-releases of Super Mario Bros Deluxe, Mario Kart 8, Donkey Kong Country and many more for proof of that. I think a Switch release would make more sense, but Bowsers Inside Story needs both screens to play properly. This was my first Mario and Luigi game and I loved it, replayed and beaten multiple times. I now have all the games in the series. However, I don't really feel the need to get the remakes, even if it was on Switch. I just want a new M&L game for Switch. If on 3DS, I'd still probably get it because I still love the 3DS lol. Call me old-fashioned, but I actually prefer the 3DS to the Switch because it's more portable, has a stronger design and handled the 3D really well. I love my 3ds, but I can't buy the new Bowser's inside story because I only got the Ds version recently off eBay, and I can't justify $60 Australian for a port of a game that I already have that didn't need a port, as the 3ds already runs it ... Who decided this would be a good idea? @TheAwesomeBowser the Switch is just as portable as the 3DS. Plus the Switch has 800% better graphics. (Rough estimate). There is absolutely no reason to release a game exclusively on the 3DS. For instance: the game doesn’t even support 3D. Good, this piece of obsolete hardware has been on breathing tubes for far too long, time to end its miserable existence and bury it 6 ft under ground. Now bring Mario & Luigi to the Switch, and I mean a NEW game. @sanderev The Switch is too big to even take into the car. The 3DS is easy to use on a plane, on the train, at a friend's house, etc. Switch only has 2x better graphics in portable mode and even then, graphics don't matter. 3DS barely takes damage from a fall. Switch will go kaboom from a fall. I seriously don't get why you people keep begging to have 3DS games on the Switch just because Switch has better graphics. @Joeynator3000 Explain what the heck is wrong with that. @TheAwesomeBowser The Switch is handheld more powerful than the Wii U. The Wii U is about 2 times as powerful as the Wii. The Wii is about 2 times as powerful as the 3DS. The 3DS is only about as powerful as a GameCube, and even that is stretching it. Also I take my Switch with me everywhere I go. I never have any problem playing it on the go. 99% of my Switch playtime is in handheld mode. And a lot of that is on the train, in the car, in public transit in general, at home. And sure, it's not just about the graphics. But the Switch also has a bigger screen, a faster OS, higher resolution and has far better games. Let's see that 3DS handle BotW or SMO. I love my 3DS. But the Switch is so much better in every aspect of it. For me the 3DS died the day the Switch was released. Also the Switch isn't a lot bigger than the 3DS. The Switch with Joy-Con detached is about the same size as a new 3DS XL. @sanderev I smell fanboyism. Xbox One X is more powerful than OG PS4. OG PS4 is over 2x more powerful than Switch. Switch is only about as powerful as a PS3, and even that's stretching the truth. Also, Switch is the size of an A3 document. It's too big to take on the go. 99% of my Switch playtime is in docked mode. I'm sure the New 3DS could handle a slightly watered-down version of SMO, just like Captain Toad. I love the Switch, but the 3DS is more portable in every aspect. @TheAwesomeBowser The Switch is ABSOLUTELY more powerful than the Wii U. And so even compared to the PS3. (Wii U was more powerful; see Bayonetta 1 on Wii U vs Switch vs PS3) Just look at games released on both Switch and Wii U. On all of them the Switch version is superior. And yeah, the 3DS could handle a watered down version of SMO. Even the original GameBoy could handle a watered down version of SMO. it just matters how much you "water it down". And the size of an A3 document? WTF you talking about, the Switch with JoyCon attached is smaller than an A4 document. Nintendo deserves this for making a lazy port. No 3D and can't even run at 60 fps. The old DS game is 60 fps and looks better, what's the point of this port then? @TheAwesomeBowser "It's too big to take on the go"
I might have to pick this up now, might be worth something someday. The news itself is not really surprising, none of the 3DS games have been selling all that well lately. Sad to see a generic platformer outshine a unique and original game (even if the original is better). @RupeeClock I think low resolution sprite work can do fine on the switch... but it needs to have a development budget and consumer price point that reflects it. A classic style Alpha Dream Mario RPG retailing for $30 on the switch would sell like gangbusters. Sure, there are plenty of popular titles that use "retro" graphics or detailed spritework, mostly download exclusives from indie studios though. That's sort of the position AlphaDream find themselves in now. they will need to adapt to a new platform environment that is closer to indie PC gaming than handheld gaming. Looking at Inti Creates, they made this sort of transition quite well, they are more varied than "RPGs with sprites" with what they produce mind you. Man, the DS and 3DS are over six years apart in release. For younger owners and female owners, I don't think the assumption that they also owned a DS hold true. But yeah, as you say, the original DS release still runs perfectly fine on 3DS, so even if people didn't have a DS, they could still have purchased the game at any point in time over the years, if they had any interest in it at all. @Waluigifan it's unfair they skipped Partners in Time just for the sake of pandering to Bowser and Fawful fans. @Joeynator3000 I still want Nintendo to support the 3DS and I have a Switch. I'm looking forward to the last Etrian Odyssey and Persona Q2. It is easier to take my 3DS with me wherever I go than it is to take my Switch. Also, I mainly play my Switch at home whether it be on my bed or in front of a tv. @Mando44646 @sanderev Try to fit a Switch in a case into your pocket. I dare you. Maybe then you'll understand me. @oninowon Finally, someone who understands me! @TheAwesomeBowser I never put expensive electronics in my pockets (except for my phone). Also try fitting a 3DS XL in a case in your pocket. @sanderev I have to dispute that the Switch is just as portable as the 3DS. The 3DS does not need a case when on the go. It can fold thereby protecting both screens and the analog stick whether it be in the pocket or in a bag. I do have a hard shell on mine because I want to keep my original 3DS metallic blue scratch free. With the Switch you definitely need a case, preferably a hard case. You not only have to worry about the screen but also the Joycons. The place where the Joycons attach to the screen feels a bit weak. The analog sticks, themselves, make it hard for anyone to just stick it in your pocket (if you can fit it in your pocket). Finally, switching games on the Switch is a bit of a chore compared to the 3DS. The Switch's port is enclosed whereas the 3DS is not. I don't think it is fair to call the graphics of the 3ds remake "bad" just because it's not the original. Its true that the original has that certain charm that's been brewing for 10 years because many of us played it as young kids. It's a very cartoony and goofy looking experience. However, I think that those things make it the perfect recipe for some particularly powerful nostalgia that skews people's current perceptions, because the remake is the objectively better looking of the two versions and there is no other reason to say that the original "looks better". The remake gets rid of those black outlines around everything, makes the environments more realistic and colorful, and there is now shading that adds more depth. The environments themselves are now more detailed, (for example, Bumpsy Plains now actually having visible grass instead of a sea of yellowy green, and Bowser's insides now have floating cells and microorganisms). I concede that the frame rate and a few sound effects were made less enjoyable, though. But those aren't deal breakers by any means. What ISN'T to love about this new look? There is no need for such a mawkish attachment to the original. Next, some people think this game should have been on the Switch instead. It would undoubtedly sell millions, but would you guys really be happy with how they would have to fundamentally redesign the game for that to happen? The game makes constant use of both screens, touch controls, and mic controls (in the original). It would hardly look or feel like the same BiS we all know and love. At least on the 3ds, it can retain the same classic feeling and look. If people aren't happy with the small changes made on the 3ds, why would you be any more satisfied with a flat out renovation? They might as well make a brand new M&L installment for the Switch instead. So what if the original is playable on the 3ds? That shouldn't be a deterrent to people who have genuine interest in this game. If you want it, get it! It's not the end of the world if you have to bust out your older hardware for another game. I seriously doubt that the people who wanted Partners in Time to be remade would be any happier if that DID happen instead of BiS. The same complaints would be here: "The original is playable on the ds already!" "Why isn't this on the Switch?" "The original is way better!" The results would have been the exact same, possibly even worse since PiT wasn't well received compared to other M&L games to begin with. The recent mawkish attitude towards that game is due to nostalgia as well, not that I hate PiT, I love all M&L games. The Bowser Jr's Journey portion is not terrible at all. Its story is amazing and it's full of memorable moments. What a shame that people are overlooking it. Dieter's quotes are the best. "It'll only alter 97% of your DNA." But really, it's got genuine character development for the Koopalings and junior and it actually has a moral. Overall, I had a very fun time with this remake and it's such a shame about how it's got all these factors working against it. It looks and plays phenomenally, and I daresay the definitive version of BiS. It will be underrated forever and I SERIOUSLY hope that haters don't kill the series by not buying these games. On Nintendo's end, someone over there better understand that it's not "Mario & Luigi" that people aren't interested in anymore, it's the 3ds, and that the series should continue on the Switch to boost sales again. It felt good to get this off my chest, thanks if you read the whole thing! @AlphadreamEmpire I don't dispute how much fun can be had with M&L Browser's Inside Story (have not tried Browser Jr's Journey). The series, as a whole, is great but (for me) if you are going to put it on the 3DS, use its unique feature, which obviously is the stereoscopic 3D! Sure, the little improvements for the 3DS version is good but if Nintendo wanted me to buy it again for the 3DS, then put that feature in. @oninowon I agree that it would have been cool for Alphadream to include the 3d feature, but they did not do it because that would have required them to restructure the game so that the inside bowser sections and overworld sections could both make use of it. I don't know how well that would have worked out for them or the fans' reception of the game. The original BIS sold over 4 million copies and the 3DS has backwards compatibility. Most people wouldn't buy this because they already have the original game. The 3DS also had little interest during the period this game was released. Now that the 3DS is just collecting dust these days, I have little hope that A Partners in Time remake is going to come. PIT sold half as many copies. It maybe would've had better sales since most people probably don't already own the original copy of this game. I'm not saying the BIS remake is bad, it looks great and plays phenomenally. I'm sad that it decreases the chances of a PIT remake happening. I'm probably going to pick up a copy of the BIS remake because I'm a really big fan of this series. I'm sad that the games are being very well received as the series goes on. I'm really excited for mario and luigi to make a jump to the switch. I'm excited to see what mechanics the game takes advantage of.